And here you see the front of Jammie blocking. 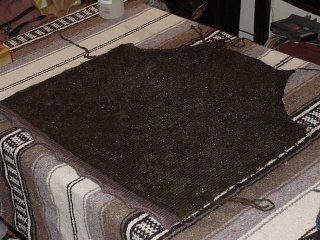 it was really hard to get the reverse stockinette to lay flat, so I'm blocking it with the stockinette side up, which is the wrong side on this sweater. I'm halfway done with the second sleeve, so I just might be able to wear it by next Saturday. Today Lynda and I met for an early lunch at the Aloha Grill in Lincoln Park before getting our hair cut. It's Hawaiian BBQ and I have been curious about it ever since I first noticed it a little while ago when I was walking down Clark. We both had the combination BBQ platter and it was really good. Lots of meat for the price. The sauces have a definite Asian flavor--sweet and savory. I'd like to go back and try their curry and the Tofu katsu. I got my hair cut shorter than usual, and the stylist convinced me to try parting it on the side. It does look good that way, but it feels really funny. I don't know if I can get used to it. Every time I have to push it out of my eyes I think of Sandra Bullock at the SAG awards and how I kept yelling at her to just move her damn hair out of her damn eyes. But mine isn't covering quite so much and I think I could get used to it. The new Rowan is out and there are lots of good patterns in it. Several folks have already started picking out yarn. Here's what I want to make. And this. Oh yeah, and this. And this one is gorgeous. And let's not forget this. And the one on the left here. I should be able to knock them all out in a couple of weeks, right? Your hair is adorable. A side-part is the way to go, and who needs to see when you can be cute. Yesterday was fun. Next time we should go to Hema's Kitchen. Thanks. I'm already starting to get used to it. Hema's, hmmm? I think I feel another haircut coming on real soon!